We are so not perfect but we’re working at communicating better and I just want others to see that we love each other and we have fun together. Marriage is fun people, it’s not a ball and chain, I hate that mentality. I love my husband =)!!! Yes, we’ve encountered bumps (and mountains) along the way and we’re not perfect at all but we’re fully committed to each other and love each other despite our imperfections. When most cultural examples depict men as childish idiots who can barely tie their shoes, I’m so thankful for the wonderful husband God has given me and strive to be the best help-meet I can. Long ago now, my good friend promised to tell my new husband, “You married a sinner!” And she suggested that we needed to have a fight before we got married to see if we were both pouters. Whatever do you suppose she meant by that?! Now, to address the “encourage ourselves” part of this week’s post– I thank the Lord that I love my husband and he loves me and we’re committed to working through things instead of letting them be the beginning of the end. I’m thankful for all the patience my husband shows me when I frustrate him and I’m thankful that I give him grace and show him patience too. I think, sometimes as women, when our husbands do something to irritate us we want to tell our moms, sisters or friends about it. I used to call one of my friends and tell her. But, I am thankful that early in my marriage a pastors wife said “if you ever have anything negative to say about your husband, tell it to God and no one else”. I now give that advice to others. We are not perfect but we have an amazing marriage! My husband and I have had to go through some ongoing serious battles with trust issues in only 2 1/2 years of marriage. I have been so tempted to respond with anger (and I usually do for a little while), shame, and belittling. God always reminds me that I too am a sinner and am in no way better than my husband, though his sins may often look worse on the outside than mine. But even though it’s been hard on us, we have grown and matured so much by learning to truly forgive each other the way Christ forgives us. There is no end to the love and mercy you can extend to your spouse and others when you know how much has been extended to you! I too struggle with staying positive when around friends. While I tend to not say too much about my own husband, I am quick to smile, nod and agree when they put down their own spouse. This is truly a timely post as I head into another busy week where it is all too easy to feel negative. Remembering to pray will encourage me to stay positive and support my husband through his day. The second is in the way we fight. When we get mad- both of us will simply stop talking and tense silence reigns for the night. We always (almost always) make up the next day…. but man do i wish I had the guts and the grace to humbly confront the cold silence…. Laura, thank you for specifying that men-bashing is not the way to go. It’s so uncomfortable to hear it when women do that, and I never know how to deal with it. I appreciate your pointing out that none of us are better off when that happens. Having been married for just a few years, I still feel like a novice, although we got married later in life. But what has surprised me in these years is how much it matters that we both be ourselves. And give one another the safety to deal with things honestly and for real. I didn’t have that kind of environment growing up, and it’s been a learning experience for me. But oh, so worth it! When I’m mad or sad, I can let him know (and he cheers me on as I express my feelings). When he’s feeling down or is upset at something, I know that even if I have to work at being okay with it, it really is okay. One of the things that I’ve learned about “being real” in my marriage (8 years) is that most of the time when I’m mad at him, it’s usually my problem. I’ve let 20 little things build up until 1 thing he does makes me furious! And that’s my fault for letting it build up. Also one of my short comings is expecting him to read my mind. I’ve learned (esp about my husband) is if I don’t tell him, don’t expect it to be done! So usually if I’m angry, I first search myself to make sure that the anger I’m experiencing isn’t coming from my own problems. Hee hee, this is a good opportunity to share that I told my hubby that I wanted chocolates for Valentines this year. He’s never done anything for the holiday before, and of course when we were dating I told him I thought it was a silly holiday (but back then he used to bring me flowers every week so I was getting my fill of romance). But now he doesn’t do anything romantic, not really. So instead of getting mad at him this year, I told him what I needed emotionally and physically from him on February 14th. When he acted puzzled, I explained that I missed the romance, and sometimes I don’t want to be treated like a mommy, I wanted to be treated like a lady. It was a big moment in our relationship, because I told him what I needed instead of childishly hoping he would magically guess and surprise me. I have to laugh when I think about that conversation because he was so sweet about it but had no clue what day Valentines was, and then wanted to know why I wanted chocolates because “you’re not going to eat them anyways.” We had a good laugh about my bad track record with sweets (I’m a nibbler and a saver). It was such a painless conversation, and so much better than me feeling hurt and disappointed and resentful!! Sometimes I get discouraged because my husband does not meet all of my expectations, but then I think about that I probably don’t meet all of his either and that puts me in perspective. One thing that I do that really keeps me on track is to PRAY for my husband every day. Not only do I pray for him, but I pray especially for myself (See Power of a Praying Wife). I am so thankful that I married my best friend…I love him so much and really thats why I think my little frustrations with him affect me so much! If I was not so passionate about the guy, what he did would not matter to me. I do realize though that when our fights are ugliest is when I am being self-centered and wanting it “my way or the highway”. I am thank-full that I married a Godly man and that we can look to the Lord to perfect us. Thank you for this series, it is a timely reminder to me. Thank you so much for this post. I rarely EVER meet my husband at the door at the end of day, let alone acknowledge he has entered the house! Not because I don’t love him – I do and we have a great relationship. But he walks in and the kids attack and want his every attention and just let them. In my mind it is like this: “Oh, good, he’s home. I can do what I need and he can take care of this kids.” He’s MY help-meet. I do not want it to be that way and this was a great eye-opener to something I never really gave a second thought but I know he will truly appreciate the loving attention. This is for a little chuckle. A few years ago in church, the teacher in the class asked, “who in here is perfect?” I raised my hand, and she then said, “well, most of us are not” and then continued with her lesson. A friend came up to me after classs and said that I must have some type of explanation to my comment, and I explained to her that I was perfect at being imperfect. We both got a chuckle. Our husbands are perfect in that area also. Perfect at being imperfect. My husband and I have literally been to hell and back in our almost 5 years of marriage. There was a time about 2 years ago when we couldn’t stand each other. I didn’t like him and he didn’t like me. We would spend the evenings playing with our 18 month old son and preparing for the very soon birth of our daughter, but we had nothing to say to each other, nothing in common, nothing to share. Any attempts at conversation always led to horrific blow-out arguements. My parents are divorced and his mom is remarried, so I was always asking myself the question, “Why not just get divorced?” The problem was that there was this small piece of my heart that could almost see the person I fell in love with 2 years earlier. His parents encouraged divorce, and oddly enough my parents kept telling us to give it some time. They were still grappling with the devastating pain of divorce in their own lives. They didn’t want us to give up. Everything changed when I went in for my 2nd c-section to have Izzy delivered. I had been on blood thinners during pregnancy and the dosage was miscalculated before delivery. I nearly bled out on the operating table. In recovery they couldn’t get my heartrate to stabilize for several hours. It was scary. But most importantly, that near death experience brought a lot of my own selfishness and pride into clear focus- it was sin. The road from that day, September 14, 2007 until today has been long, painful, full of tears and prayers and constant failures. I’m still quick to belittle my husband and disrespect him. But thank God I’m not where I used to be. My husband is my best friend again, and we have never experienced as close of a relationship with anyone else as we do with each other. The book that helped me the most was “Power of a Praying Wife” by Stormie O’Martin. I still pray those prayers almost every day. The most important part, to me, of being the best helpmeet as possible for my husband is going to God Himself each day asking for my eyes to be opened to how I need to change, what my wrong actions and behaviors are, etc. He never lies to me, and His advice has never been wrong. Honestly, it was a lot easier to respond to the “real moms” post. I think because I know I am a good mom even if my house and kids aren’t perfect but I know I fall waaay short of being a good wife. I have trouble letting go of past hurts, remembering that he is not perfect (and neither am I), and keeping score. I pray for our marriage every day because I know Satan would love nothing more than to split us up. I just cringe typing these words out. I felt this way because I did not want to marry someone like my dad. Every time my husband would ask for something it would make me think of my parents marriage and I would get very “independent” and selfish. We have hit several rough spots but have come a long way. 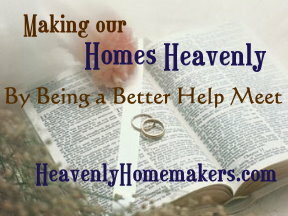 I have been praying for my husband and our marriage daily and then God led me here. I am so excited to become a better help meet for my husband. Thank you!